Thanks for visiting Gold Rush Nuggets! My name is Matt, and 2018 marks my 8th year in the business of selling gold nuggets. I created this website to provide collectors and investors with a safe and reliable place to purchase gold nuggets and gold/quartz specimens. My goal has always been to have a unique inventory of high quality gold nuggets and specimens at fair prices for my customers. Gold prospecting has been my passion since I've been a teenager, and over the years I have expanded this site beyond just selling gold nuggets. Spend some time exploring and you will find hundreds of articles aimed at teaching others how to find gold. The gold nuggets I sell are priced at a level that I know they will sell. I am constantly updating inventory, adding new gold nuggets and specimens, and adjusting my prices to reflect the current market. I like to sell gold so that I can buy more! About 1/2 pound of gold nuggets from Australia. If you are a prospector who is looking for a place to sell your gold, please contact me. I am always interested in finding new and unique sources of gold nuggets that I can supply to my customers. I can't tell you how many prospectors I have talked to who have been sending their gold off to the refinery and getting lousy returns for their hard work. Let's keep those nice nuggets out of the melting pot! I also have a lot of gold related information throughout the site as well. Check out our gold videos and gold pictures pages to see some of the nice gold collections and truly unique specimens that I have bought and sold over the years. Also take a look at the gold articles page, which has tons of great information about buying and selling gold nuggets, gold prospecting, and just about anything related to gold. I do my very best to be accessible to my customers and respond quickly to all calls and emails... With that said, sometimes I am out chasing gold, away from computers and cell phones, so please understand if it takes an extra day to get back to you. I work extremely hard to get all orders shipped out promptly and keep my customers happy. That is how I would want to be treated, and that is how I treat the folks who do business with me. I love talking to my fellow "gold bugs" out there! Let me know if I can help you add some gold to your collection. I welcome any questions or comments. 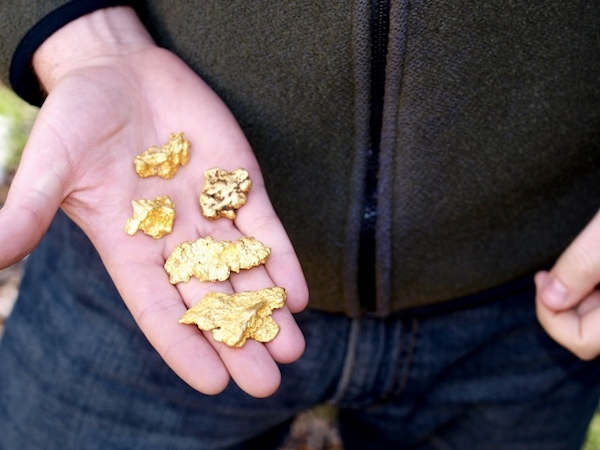 If you would like to stay updated about new gold nuggets for sale, gold prospecting articles, etc., you can sign up for our newsletter by clicking the link below.